What Is DD Form 1387? 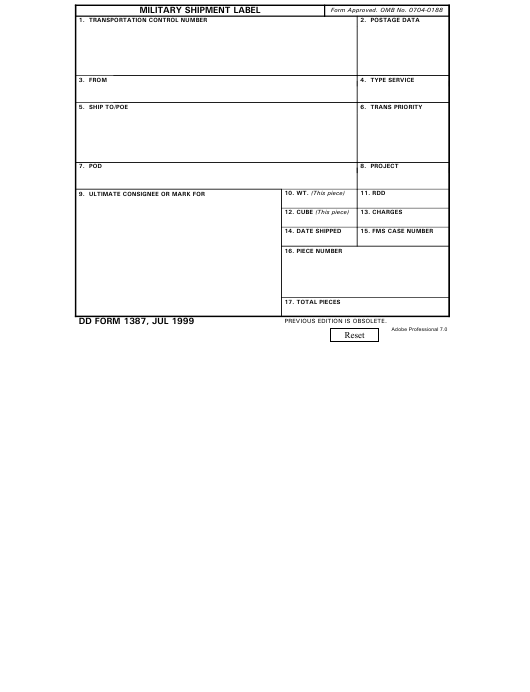 DD Form 1387, Military Shipment Label is a document used for marking all military shipments, including the shipments of vehicles or equipment. All cargo must be labeled with a DD Form 1387 for every deployment or redeployment of a unit. The Department of Defense (DoD) released the latest version of the form - sometimes incorrectly referred to as the DA Form 1387 - in July 1999 with all previous editions obsolete. An up-to-date DD Form 1387 fillable version is available for filing and download below or can be found on the DoD Executive Services Directorate website. If the shipment is classified, contains hazardous materials or requires special handling, the cargo is labeled with the DD Form 1387-2, Special Handling Data/Certification. How To Fill Out Dd Form 1387? Boxes 16 and 17 require specifying the number of the piece the label is attached to and the total number of pieces in the shipment. The required barcode items are: Box 1 (Transportation control number), Box 9 (Ultimate consignee or mark for), and Box 16 (Piece number).